Anjelica Huston was not a name I recognised before I started reading her memoir A Story Lately Told, although maybe I should have, given her fame and high profile career as a model and actress. To be fair, the highlights of her career took place before I was born, and more than anything I was curious to read this memoir of what appeared to be an enchanted childhood, growing up in Ireland, London and New York. Maybe if I had known more about Anjelica and the major highlights of her career I would have read her memoir from an entirely different perspective, one of nostalgia, instead of one of genuine curiosity. And maybe if I’d known more, I wouldn’t have been so disappointed and frustrated. Huston was born in 1951 to Enrica ‘Ricki’ Soma, a talented ballerina, and John Huston, a gifted Hollywood director and actor. From the beginning, it is presumed that Huston will follow in her parents’ footsteps for a career in showbiz. Huston recounts her childhood living on a large property called St Clerans in Ireland, and then her move to London with her brother Tony and mother when her parents separate, and finally her move to New York when she is seventeen, after her mother dies in a car accident. The memoir ends when Huston makes the decision to move from New York to Los Angeles when she is in her early twenties, and the next parts of her life are forthcoming in part two, to be published in early 2014. I couldn’t get into this book at all. It may have been naive of me to think I could: I love memoirs which recount people’s stories of struggle and hardship, or sheer determination, which they overcome to find peace within their lives. I find the stories of ordinary people so inspiring, more so because their journeys were not broadcast to the world as they were happening, as is often the case with the celebrities. That is, of course, not to take away from anyone’s story, but in Huston’s case I didn’t have to: she did it to herself. As a reader I was constantly told this and told that; this happened and then that happened. There are a few rare instances when Huston manages to build a scene to a powerful moment, such as the chapter where she describes the aftermath of her mother’s death, which is beautifully written in careful, understated language: ‘When he walked in with Neil Hartley, I said it quick, “Mum’s dead,” and I watched the horror spread across their faces. That was really my proof that it had even happened—the effect of the news on other people’ (pg 187). 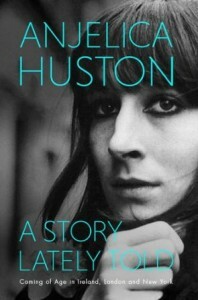 For the most part, Huston does not give the same care and attention to her other life experiences, and prefers to delve into great detail about house furnishings and the way people of the time dressed: ‘The walls were papered in a reproduction of a Kenzo screen, which Dad had a printmaker make up in Japan—a bird standing on a flowering stump of wood. The tiered Italian candelabra was hand-lit at night, and the long mahogany table shone with Georgian silver and Waterford crystal. Across the hall was the drawing room, its colors pale gold, gray, pink and red’ (pg 50). This description continues on for two more paragraphs, detailing rooms which are never again mentioned in the book. In itself these details are not a bad thing, but after Huston spends so much time setting the scene, I was waiting for as loving a retelling of the incident she’d just set the reader up for. More often than not, this description falls into one or two sentences where the reader, again, is told what happened, rather than invited in to experience that moment as Huston herself had. Huston’s memoir is interesting, and she has certainly lived an amazing life, full of experiences some people can only dream of. But as I read the book I couldn’t help but think her life story may have been better told through the medium of film, a medium which has been a part of her life since birth, rather than through the pages of a book which continuously keeps the reader at arm’s length, and reduces many of Huston’s experiences to trivial episodes. Even so, I think for fans of the actress, this memoir provides an intimate insight into the experiences and places which shaped her life. This entry was posted in Books, Memoir and tagged autobiography, celebrity, childhood, coming of age, ireland, london, memoir, New York, Review. Bookmark the permalink.